The late summer sunshine is getting lower and lower in the sky, and it's all the more beautiful for it. It was a fading, leaf fluttering, scuffed up, slightly battered weekend, but in a good way, mostly. Because here's my observation of the week: some days I wake up and look at everything around me and think - argh, it's all worn out and needs changing and replacing (and those days I'm often full of zip and wanting to get things done) and some days I look around and I'm more than happy with the old and the worn in and the comfortable. And actually the comfortable days are best because sometimes you don't need to get a lot done or go looking for the new to have a good time. I found some ancient cowboy boots in the back of my cupboard and I pulled out an old, old soft brown leather bag and I read my book for the Laura Ingalls Wilder class starting today and I sipped my cough medicine in the bottle which looks like a bought it from the back of a wagon and it was all even more cowboy than last weekend's check shirt and moustache. There has to be a layout in that. Have a great week! And if you'd like, please do give me a Monday wave. Last week Alexa and Alison and Deb, Fiona and Liz and Ruth and Theresa all joined in. Thank you! Thanks for the chance to win"
Elizabeth please email me and I'll pass your details on to May. I'm looking forward to meeting you in class. All sounds good....apart from the cough mixture....I'd love to know how the pulled beef worked out. I've pulled out my autumn jacket....though I don't quite need it yet....it's 20 years old [at least]....it's been washed a million times [even though it's wool]....it's getting a bit threadbare....and should go into the charity bag....but I just can't bear to part with it!! Sorry to see the cough syrup in the collage, but the rest is lovely. I LOVE those boots; just bought myself a pair of red boots. I passed them up last year (several times) and when I saw them again this year at the same discount shoe store, I grabbed the last pair in my size. Sorry to see that cough mixture was part of your weekend - and yuk to the taste of that particular brand - you must have felt bad to have to take that. Thanks for the lovely card which arrived this morning - what a lovely surprise! Do you think it's odd that I like the taste of Corvonia? I've also been pulling old clothes and shoes out of the backs of wardrobes and drawers, except that I am now giving them away to a good cause and not giving them a new lease of life with me! Hope the cough's improving...although not at boot weather, we have definitely seen a change (for the better) over the weekend! Love the boots and there's something special about a well worn in leather bag. I'll be waving back later. I don't know where today has gone! That's what I get for a weekend gadding about London! I love your fall posts and your words for this amazing season. I too am enjoying the low sun although today it is indian summer! Hope your cough gets better. There is a bad bug going around here with an epic cough but Rob and I got it early this time round... in July. Finding a old loved handbag is a joy, and what a lovely soft looking one it is. I loved your words today Sian. I really enjoy the slower pace that Autumn seems to bring. I like rummaging through cupboards and pulling out those favourite jumpers again. Love your boots too and hope the cough goes away soon! 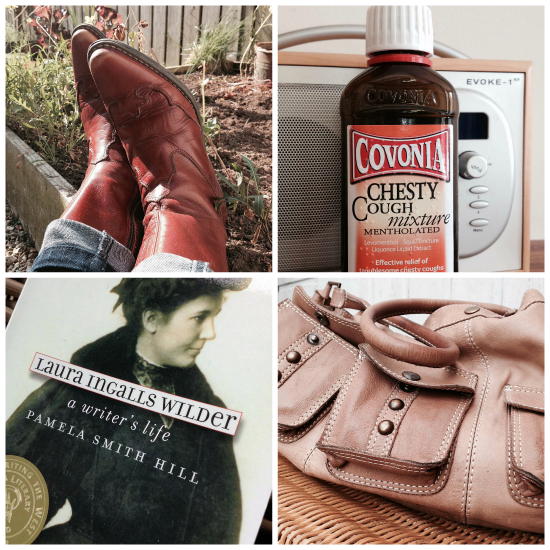 Sounds like a nice weekend (except for the cough syrup!). I haven't got a copy of the Laura Ingalls Wilder book and Amazon is out of stock. Trying to decide if I want to get the Kindle edition so I can get started. Pulled beef is happening here - the last of Princess's family recipe books. Going to have to look at the Laura Ingalls Wilder book and class - one of my favourite authors. definitely time to find the boots in the back of the wardrobe now - although wellies were more appropriate on Sunday. hope the cough syrup is doing it's job. Loving the boots and the bag! I had no idea cough medicines still had wonderful labels like that! Hoping the cough has gone now ... Your faded cowboy/girl theme and words about the weather really echo here this morning here and I'm reading a week or so late - you see? your writing is timeless. I love your photo collage! It's theme is even better ;) Oh, and that purse caught my eye!